This is the 6th tutorial in the Microsoft Mathematics Tutorial Series. In this post, we discuss how to use the Unit Converter of Microsoft Mathematics. 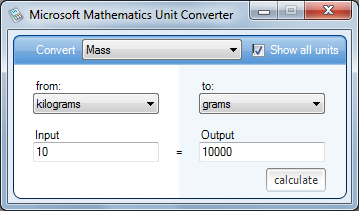 Microsoft Mathematics has a built-in unit converter that allows conversion of different types of measurements. It supports measurement conversion of length, area, volume, mass, temperature, velocity, pressure, weight, energy, power, time, and force. Click the Home tab and then select the Unit Converter button from the Tools group. This will display the Unit Converter dialog box as shown in the figure above. In the dialog box , click the type of measurement you are converting in the Convert list (e.g. Mass). Select the type of units that you are converting in the From and To list boxes. Type the measurement that you are converting in the Input box. Click the calculate button to convert. You should notice while doing the tutorial that Microsoft Mathematics supports conversion between the metric and the English system in some categories; for example, in the weight/mass category, measurement in kilograms maybe converted to pounds and vice-versa. This is the 5th tutorial in the Math and Multimedia’s Microsoft Mathematics Tutorial Series. In this post, we use the Triangle Solver to construct triangles with specified side lengths and/or angle measures. The Triangle Solver is very useful in constructing accurate triangle drawings. To construct the desired triangle, the user can specify the length of the sides or the measure of interior angles.